Managing Risks can be a wrestle for many community service organisations. How do you structure your risk registers? What do you report up to the Board? What format do you provide this information in? Folio is an intuitive, easy to use web-based solution that makes risk management wrestle free. 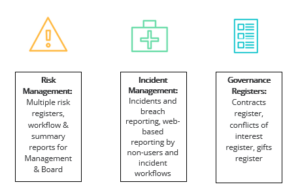 Not for Profits such as MTC Australia, Central and Eastern Sydney PHN and The Society of Hospital Pharmacists of Australia have given Folio a Go and it has quickly enabled them to roll out a governance framework and manage a range of risk areas not just their risk registers. These organisations also use Folio for Contract Management, Incident Reporting, Complaint Management, Compliance, Audit and more. On Thursday the 14th of September at 12pm (AEST), the team at Folio will host a webinar on how Folio has worked for the Not for Profit sector.